Cincy Bartiste – Bartender in Cincinnati to hire for all your party, wedding, and event needs. With equal parts experience, skill, speed, and more than a dash of imagination, Bartiste owner and master mixologist Tom Bees has perfected the art of keeping crowds in high spirits. When Tom’s in the mix, you’re free to mingle and feel like a guest yourself. With over 25 years of bartending experience and a hand-crafted mobile bar in tow, Tom is an expert at keeping a party rolling. 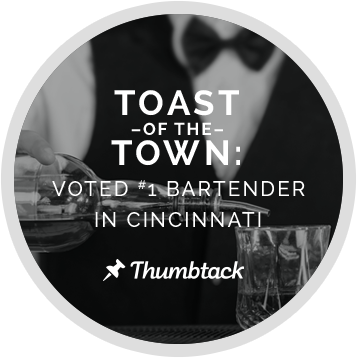 Bartiste has become the go-to bartending service for weddings, private parties, and corporate events in Cincinnati, garnering repeat business and top recognition on Thumbtack in all three years. Tom has the knowledge to keep things affordable, the skills to keep the line moving, the personality to keeps things fun. Not to mention a memory that keeps things fascinating and friendly – he has a special knack for remembering every guest’s name and drink of choice. Tom will work with you to come up with a list of what and how much you’ll need. We arrive early so everything’s in place by the time the first guests walk through the door. The drinks and the conversation will be flowing until closing time. Break down and clean up. Aside from some amazing memories, you’ll never know we were there. While bartending, Tom went to business school and graduated from art school. So he knows a thing or two about creating a fresh, festive atmosphere that’s still professional and efficient. Combined with three decades of bartending and management experience at some of Cincinnati’s busiest restaurants and bars, Tom’s fusion of skills means you can expect a flawless event. It’s enough to make us blush. Tom was an excellent bartender for our event!! We hired him for my wedding reception -- he was incredibly responsive throughout the entire planning process. He always responded to all my emails and questions within minutes. Additionally, he was always willing to take phone calls (from myself, my wedding planner, and my father in law) to discuss details and help us plan for the big event. On the day of the event, he was very punctual and professional; he arrived early to set everything up and make sure he was ready prior to guests arriving. His bar looked awesome! Throughout the entire night, he worked so hard to keep guests happy and with a drink in hand! He was such a fun bartender! I would absolutely hire him again for any event! Thank you, Tom! If I could give Bartiste/Tom 10 stars I would. If you're looking for a five star bartender for a personal or commercial event you would be foolish not to call Tom/Bartiste. As with everything in life, you get what you pay for. What you get with Tom is a professional Bartender that knows exactly how to handle all events. He arrives early and is in no hurry to bolt. I have not had a company or person work an event for me in 10 years that has been this professional, knowledgeable and treat guests like his own family and friends. I will be using him for all events in the future. Have a great 2017 everyone! Cheers! Tom Bees' prompt response was the first we received through Thumbtack. He was friendly, informative, and eager to help. We chose him above the other responses, and are happy that we did. In the weeks leading up to our event, Tom was prompt with replies and answering any questions about all aspects of what was needed and expected at our event. On the day of our daughter and son-in-law's elopement party, Tom arrived on time and went onto action. Tom was awesome! He was very professional and extremely knowledgeable. I was nervous about the amount of liquor beer and wine to buy and what drinks I wanted to serve. Tom talked me through the pre-party jitters and we had plenty for our guests. He kept the drinks and the conversation at the bar flowing. Everybody at our party loved him. Overall he did a fantastic job and I will definitely hire him for our future parties. Two Thumbs up to Tom! Tom arrived on time and looked very professional. He brought his own bar and made all of the garnishes, decorated his bar, and made his own "Hawaiian Punch" that the guests loved! At the very end of the evening, he was moving his bar (getting it ready to load in his truck) and folks started ordering drinks from him. He stopped and started making a few more last-minute drinks! I give him the highest recommendation possible. Hire him. You won't be sorry! Add unlimited water, tea and lemonade for an additional $1.00 per guest attending. event. Drop us a line today. © 2019 BARTISE. All rights reserved.